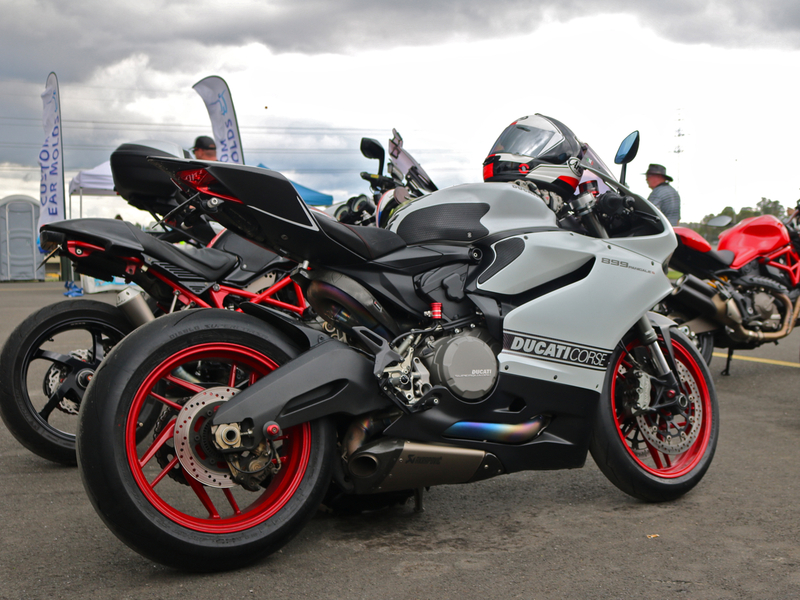 This 899 was a crowd favourite, no doubt thanks in part to the beautiful Akrapovik exhaust. When someone mentions a collection of Ducatis on a Saturday morning the more cynical motorcyclist might picture them lined up in front of a cafe, riders clad in Ducati branded leathers, enjoying their chosen brew. 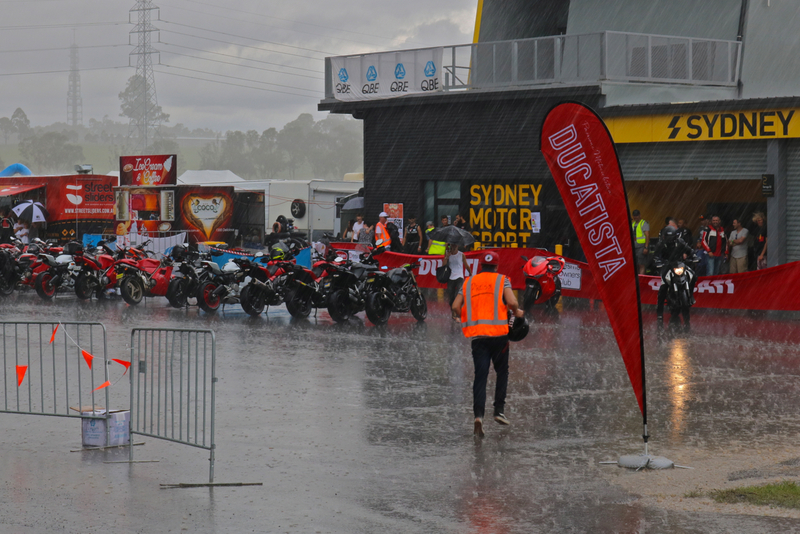 Not this time though, with Sydney Motorsport Park’s South Circuit on hand and some fairly serious machinery present, the Ducatisti Rider’s Festival proved that some Ducati’s get ridden, even when the weather turns ugly. 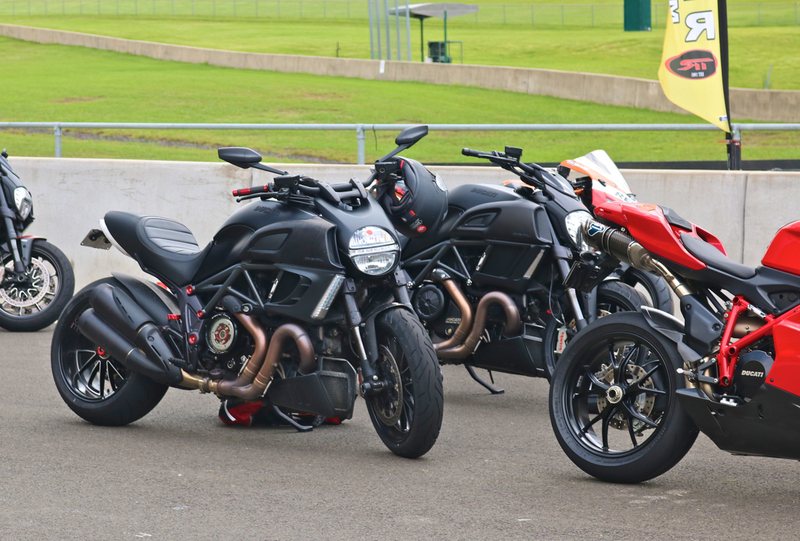 What do you call a group of Ducatis…a gaggle? a murder? 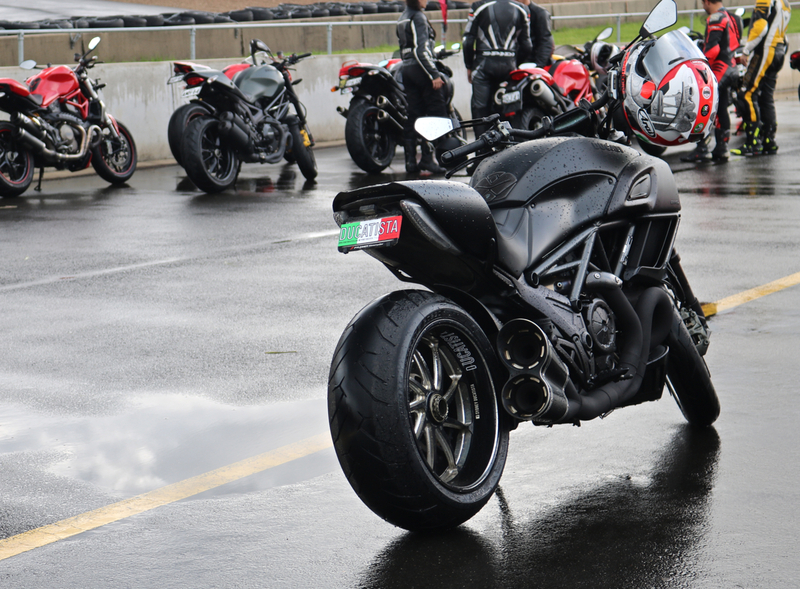 Well over 100 bikes turned up on the day despite predictions of the previously mentioned weather, with everything hitting the track from Multistradas to Panigales and even the odd Diavel. It was mostly modern Ducatis on display, with a few classic models thrown in for good measure. 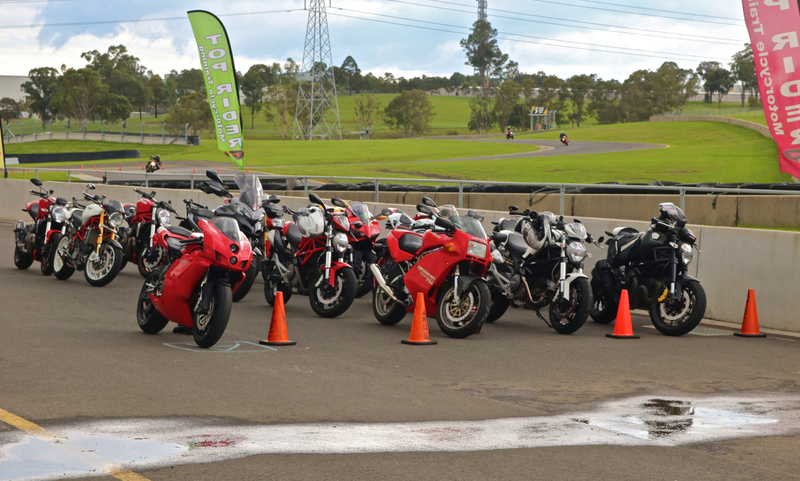 This was to be expected as Ducatisti is a group mostly made up of modern Ducati die-hards. Not designed for the track, but definitely not out of its depth. A number of Diavels were on hand to prove they’re not just a cruiser. Riders were let loose on the South Circuit in groups with some pushing the envelope a little harder than others. Having ridden on Eastern Creek’s new surface in the rain before I can confirm that it offers about as much grip as a half-used bar of soap. As such, there were a few spills and some moments that would have had riders heading back to the pits in a bid to ’empty their leathers’. Now I know I’ve been mentioning the rain, but I feel this picture sums it up fairly well. The storm hit the rider’s festival almost as quick as it left and while it caught a few people unawares, it provided some great conditions afterwards for photographing the show and shine section. 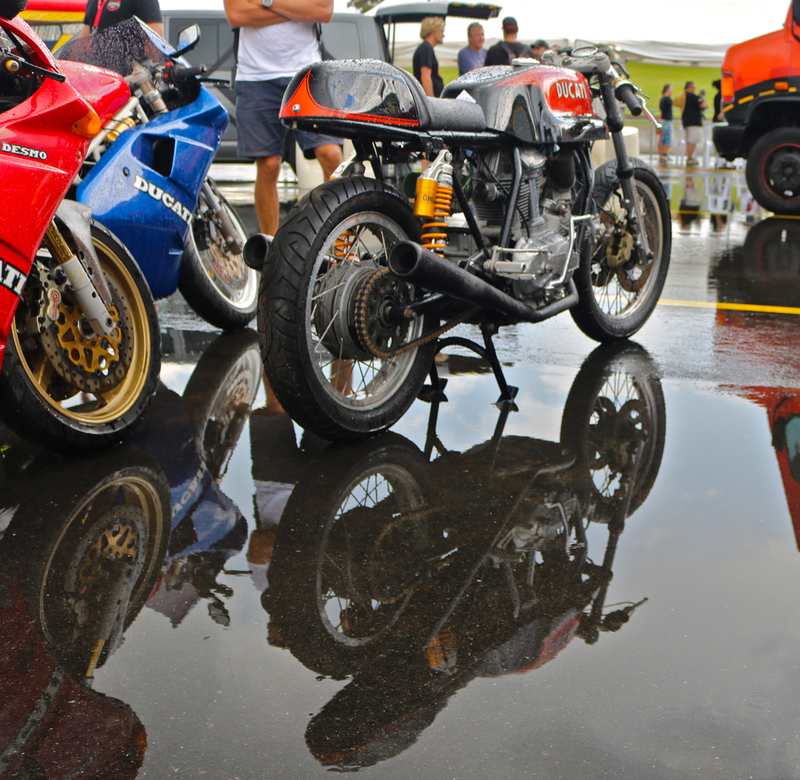 While the rain put a dampener on track time, it made for some great photos. While this festival was the first of its kind, an impressive turn-out of bikes and people in adverse conditions showed that the passion for the Ducati brand is well and truly present and only bound to grow with Ducati posting record sales in 2015. Nothing shows the march of time better than a 650 Pantah parked behind an 1198s. 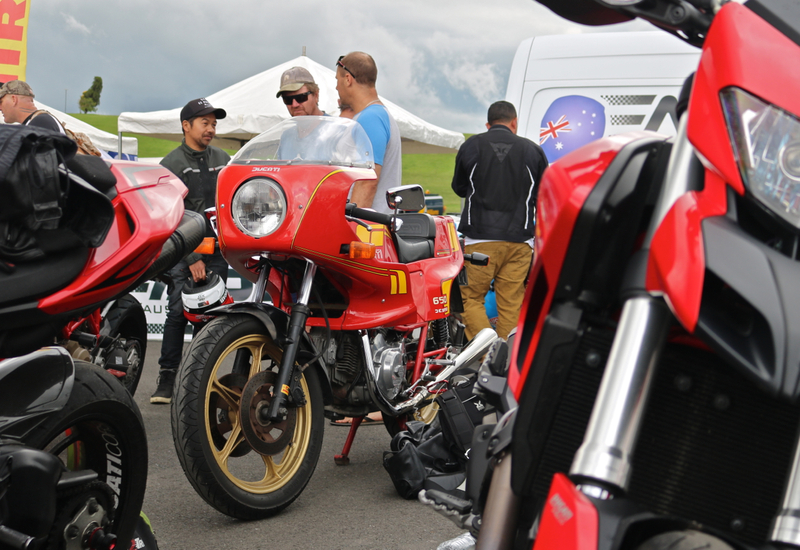 There are certain groups of motorcyclist out there who may think Ducati owners are more interested in looking at their bikes than riding them, but the Ducatista Rider’s Festival was a good way of showing that it takes all kinds. For every bike in the show-and-shine there was one on the track and the passion there is around the Ducati brand is always refreshing to see. After all, when was the last time you saw a group of Yamaha or Honda riders converging on a track on a rainy Saturday morning? re the reference to the 600 Darmah…except if its a 650 Pantah (which it is)…you are forgiven for not knowing it…quite rare…I owned one of them. nice bike IMHO.